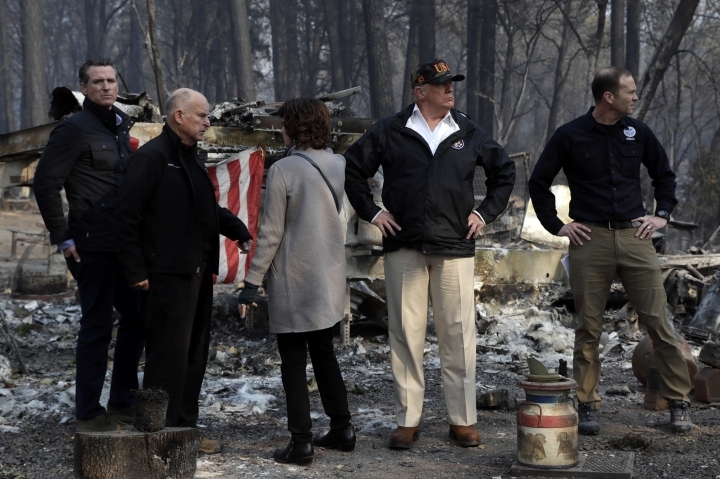 PARADISE, Calif. — From the ashes of a mobile home and RV park, President Donald Trump said Saturday he came to the heart of California's killer wildfire to fully grasp the scale of the desolation wrought on the landscape. "We're going to have to work quickly. ... Hopefully this is going to be the last of these because this was a really, really bad one," said the president, standing amid the crumpled foundations of homes and twisted steel of melted cars. With that bold and perhaps unlikely prediction, Trump pledged that improved forest management practices will diminish future risks. 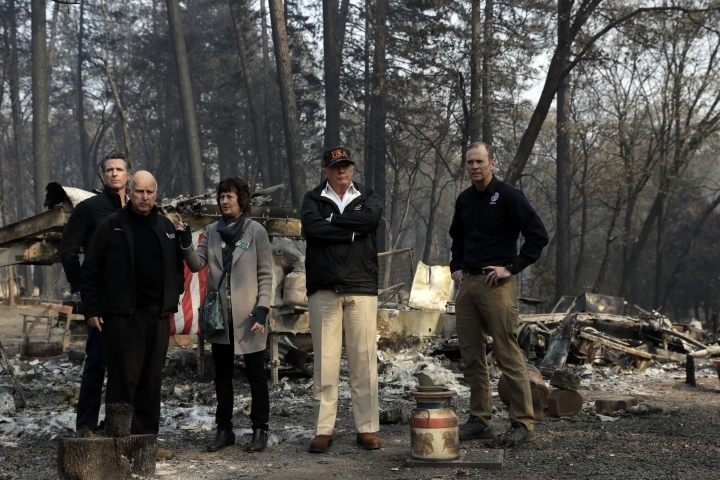 The declaration evoked his initial tweeted reaction to the fire, the worst in the state's history, in which he seemed to blame local officials and threatened to take away federal funding. When asked if seeing the historic devastation, which stretched for miles and left neighborhoods destroyed and fields scorched, altered his opinion on climate change, Trump answered, "No." At least 71 people died across Northern California, and authorities are trying to locate more than 1,000 people, though not all are believed missing. More than 5,500 fire personnel were battling the blaze that covered 228 square miles (590 square kilometers) and was about 50 percent contained, officials said. For Trump, it was a day to comfort a state grieving from twin tragedies, wildfires in both Northern and Southern California as well as a mass shooting at a popular college bar north of Los Angeles. 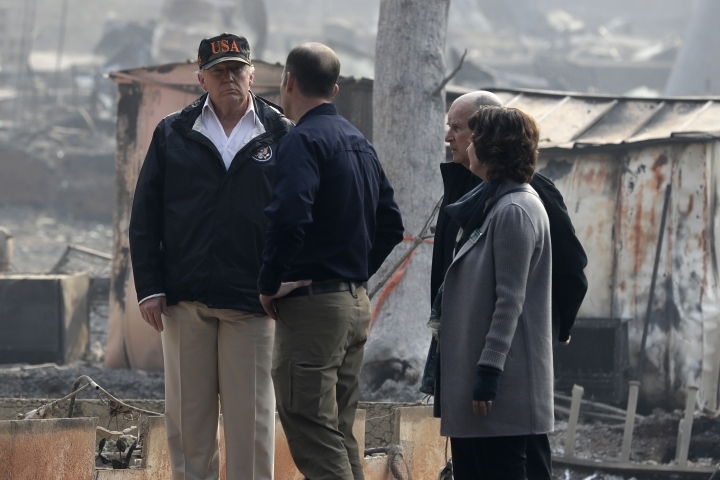 Wearing a camouflage "USA" hat, Trump gazed solemnly at the devastation in Paradise. Several burned-out buses and cars were nearby. Trees were burned, their branches bare and twisted. Homes were totally gone; some foundations remained, as did a chimney and, in front of one house, a Mickey Mouse lawn ornament. The fire was reported to have moved through the area at 80 mph. 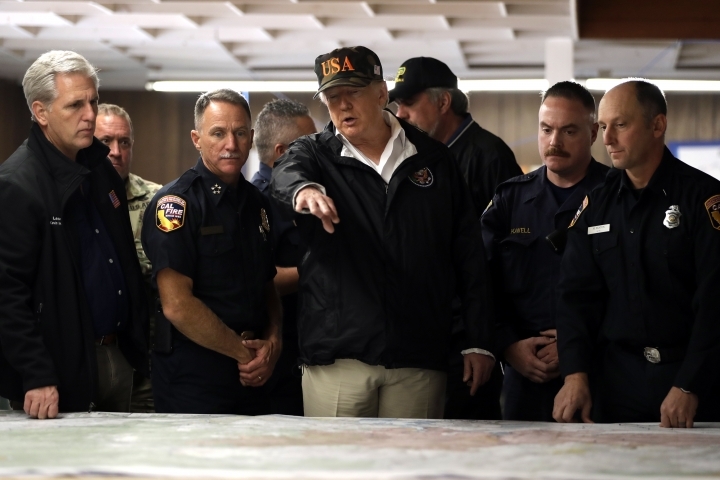 "It's going to work out well, but right now we want to take of the people that are so badly hurt," Trump said visiting what remained of the Skyway Villa Mobile Home and RV Park. He noted "there are areas you can't even get to them yet" and the sheer number of people unaccounted for. "We've never seen anything like this in California," he said. "It's total devastation." Trump, who left Washington early Saturday and didn't expect to return to the White House until well past midnight, planned to travel several hundred miles south to visit with victims of a recent country music bar shooting. A gunman killed a dozen people at the Borderline Bar & Grill in Thousand Oaks on Nov. 7 before committing suicide. He stuck to that theme in his remarks just before departing on Saturday when he outlined what he planned to discuss with Gov. Jerry Brown and Gov-elect Gavin Newsom, both Democrats: "We will be talking about forest management. ... The one thing is that everybody now knows that this is what we have to be doing and there's no question about it. It should have been done many years ago, but I think everybody's on the right side." But when he was asked by Fox News in an interview set to air Sunday whether climate change played a role in the number of serious fires, he said "maybe it contributes a little bit. The big problem we have is management." Brown and Newsom welcomed the president's visit, with the governor suggesting they set aside political differences since it "now is a time to pull together for the people of California." Brown, a fierce advocate of addressing climate change, did not respond to Trump's statement that he has not changed his mind on the matter but pointed to several causes and they need to deal with them. "If you really look at the facts, from a really open point of view, there are a lot of elements to be considered," Brown said after Trump spoke. "The president came, he saw and I'm looking forward over the next months and beyond to really understand this threat of fire, the whole matter of drought and all the rest of it. It's not one thing, it's a lot of things and I think that if we just open our minds and look at things we'll get more stuff done."